Happy Tuesday, loves! 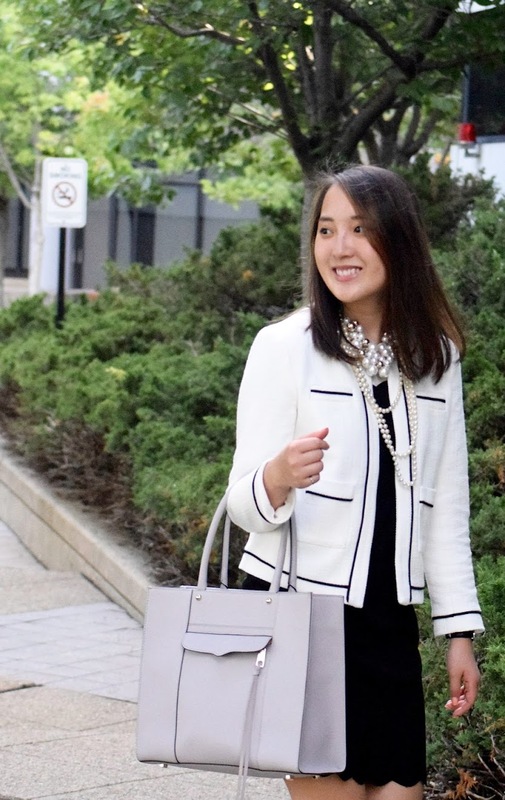 I'm super excited to be participating in the ShopStyle's Bloggers Give Back Campaign with "Dress for Success" today! 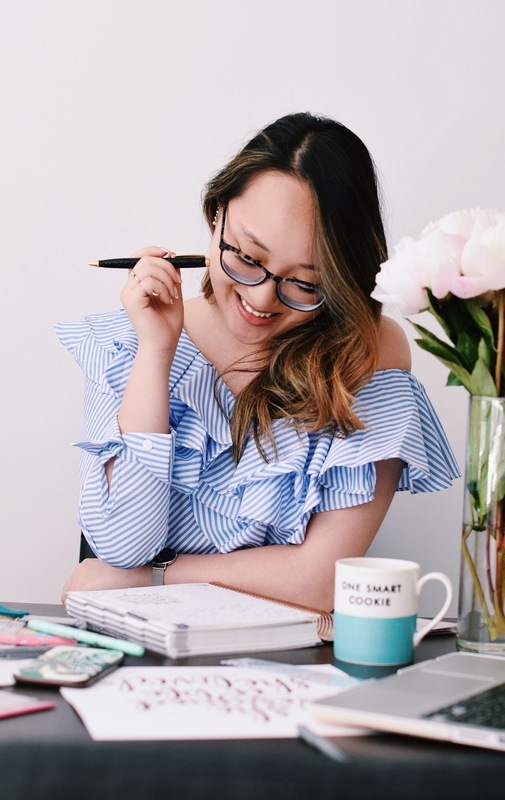 I know that often times, being a fashion or style blogger may seem like it's all about taking that perfect #ootd or flatlay--but in reality, there is so much more to it than that! Sure, on the outside, it's striving to take gorgeous, high quality photos of clothes that you're wearing (but, that's incredibly superficial and definitely NOT the point). So, what's my motivation every morning to continue fashion blogging? 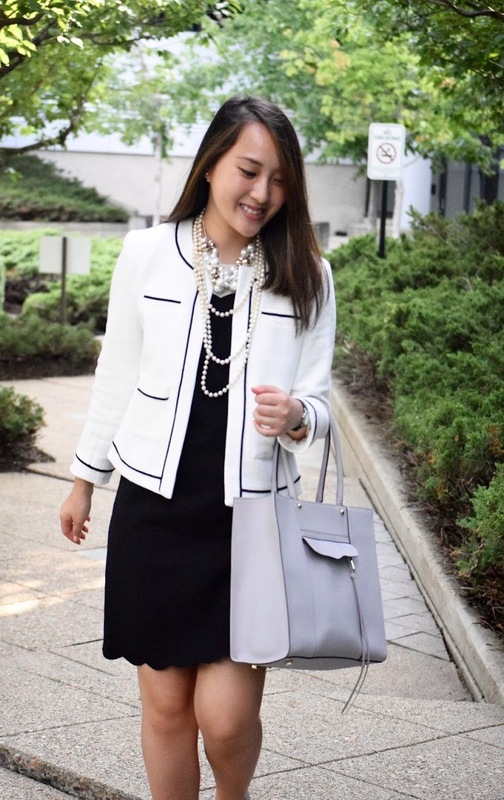 To inspire other women in their fields to dress their best, and set themselves up for success. 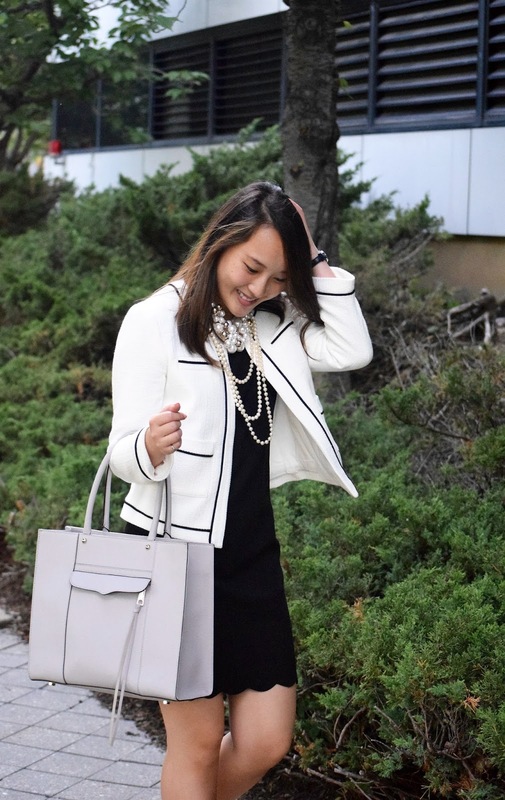 Therefore, I will be contributing 10% of my sales from my blog from Dec 8-9 to Dress for Success, an international not-for-profit organization that empowers women to achieve economic independence, and ShopStyle will be matching 100% of my contribution! Let's face it, first impressions really are everything. And let's be real, what we're wearing is pretty much 80% of that first impression--and it's why I so strongly believe that dressing your best IS setting yourself up for success. It ends up being a cycle actually...because when I'm dressed up in my "power outfit," I feel like I can take on just about anything the day is going to throw at me. That feeling of confidence on the inside most definitely appears on the outside. Because when you feel confident, you hold your head up just a little higher and stand up just a little straighter, and that kind of body language makes up the other 20% of that first impression. 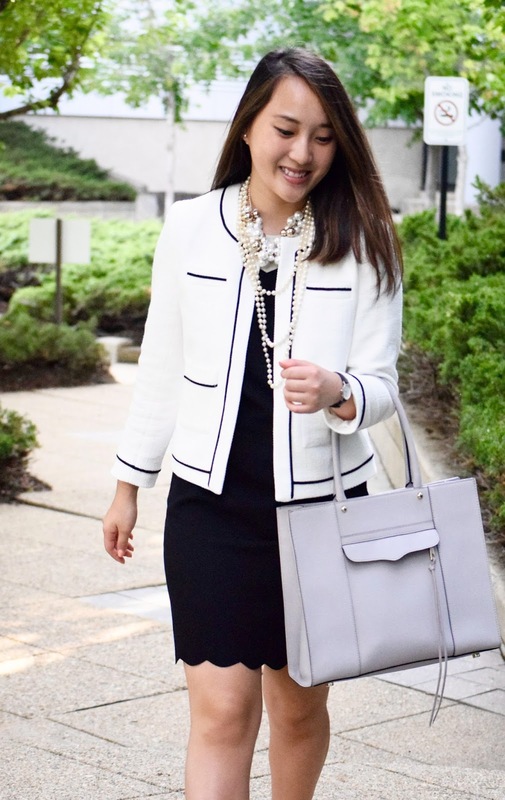 This is exactly why I wanted to share my "power outfit" with you ladies today--as well as a few women who have inspired and empowered me to go after the life I had always envisioned for myself these past few years. My personal style has always been a mix of classy, chic and a bit of that New England prep. This collarless suit jacket is pretty much the epitome of my personal style and I loved how the pockets and lining was tipped in black. 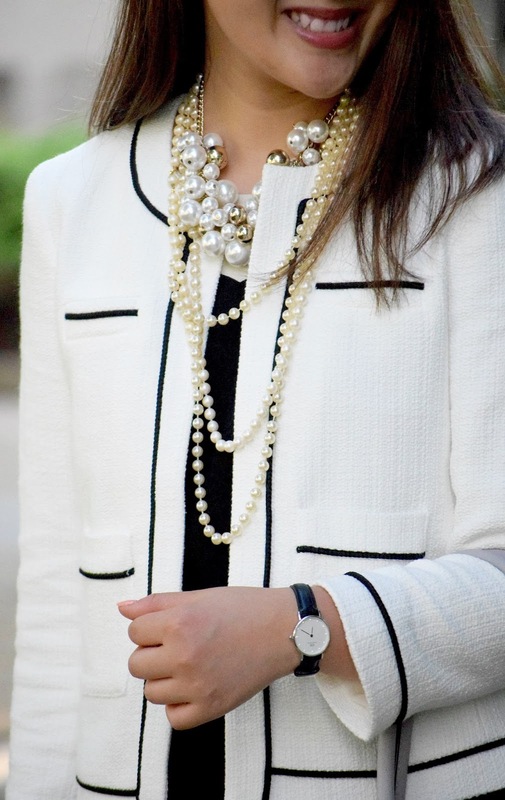 The piece itself is very Chanel-esque, so I kept the rest of the look simple with a little black dress and layered pearls as an accent. 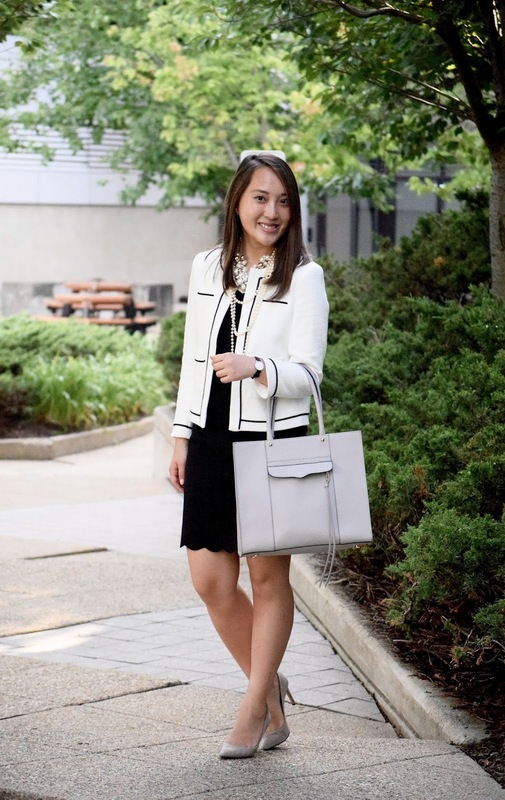 In terms of other accessories and footwear, I knew that this structured tote would continue that boxy-structured look of the jacket and neutral toned accessories would bring out the contrasting B&W of the look. To be honest, I didn't even know that fashion blogging existed until I started my first year at university in New York City. I'd always seen clothing pieces as a way to express an individual's personality and believed that there was a kind of magic in the "perfect outfit" or "perfect dress" that could empower and motivate someone to do the otherwise impossible. Moving to the fashion capital of the nation, I realized that individuals were actually sharing their daily outfits on social media and stumbled upon my first fashion blogger ever, Wendy's Lookbook. I was completely enamored by her style and her personality--her ability to inspire other women to strive to be the best versions of themselves. This was exactly what I hoped to do one day. Anddddd, two and a half years and a whole new blog relaunch later...I'm exactly where I think I should be, doing what I love every day--hoping to inspire all of you guys to live the life that you've always envisioned. I know that there's always room for growth, but honestly, I am perfectly happy with where these past few years have taken me. I hope that when you get dressed every morning, you get dressed with a purpose, with a goal in mind to reach and to allow your daily outfit to empower you and take you there. Make sure your clothes are tailored to fit your body!